What You'll Need: scriptures, Plan of Salvation Cut-Outs, GAK 240: Jesus the Christ, coloring page, coloring tools. Scripture: Moses 1:39 - For behold, this is my work and my glory—to bring to pass the immortality and eternal life of man. Note: Start by downloading a Plan of Salvation Cut Out pdf file. You only need to print the page of the chart you intend to use. Print onto card stock. Cut out all pieces and become familiar with the layout. I recommend practicing a few times before FHE. Heavenly Father made a plan for our lives. This plan included before we lived on earth and what will happen after we die. We lived with heavenly Father and Jesus Christ. We were God's spirits without bodies. When we were born we left Heavenly Father's presence and came to earth as a baby and got a physical body. On earth we would learn the difference between right and wrong and choose for ourselves what we would do. Our Heavenly Father knew that we would make mistakes. But he would send Jesus Christ to help us. After we die our body stays on earth. Our Spirit goes to a place with all the other spirits who have passed away. If we know about Jesus Christ we go to Spirit Paradise. Others who have not heard about Jesus Christ while they were on earth get to learn about Him. After we live in the Spirit World, we get judged. At this time we are resurrected and our physical bodies and spirit bodies come together again, but now our physical body is perfect. Heavenly Father knows our hearts and the decisions we made while one earth. We go to one of three Kingdoms. The very best place to go is the Celestial Kingdom. There we can live with Heavenly Father and our families. It's goodness is like the brightness of the sun. The next place is the Terrestrial Kingdom. It's goodness is like the brightness of the moon. It's not as good as going to the Celestial Kingdom. The third place we can go is the Telestial Kingdom. It's goodness is like the brightness of the stars. 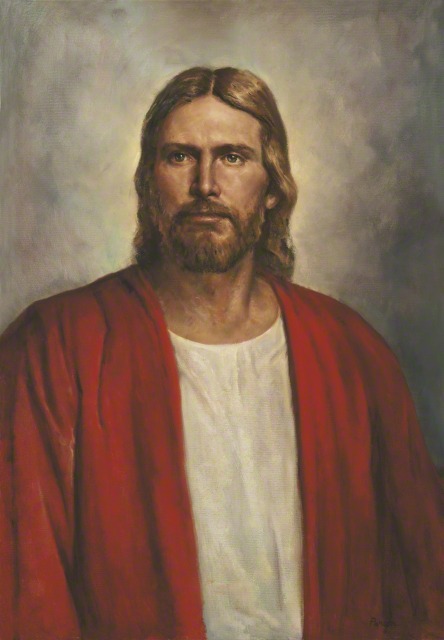 People in the Kingdom are sad because they don't get to see Heavenly Father and Jesus Christ every day like those in the Celestial Kingdom. If we obey the commandments as best we can and follow Jesus Christ and his teachings, we can become baptized, receive the Holy Ghost, attend the Temple and live with Heavenly Father again in the Celestial Kingdom and be happy forever. And that is what Heavenly Father wants for each of His children. God has given us families, scriptures, the gospel and Prophets to help us. These things teach us how to return to Him. 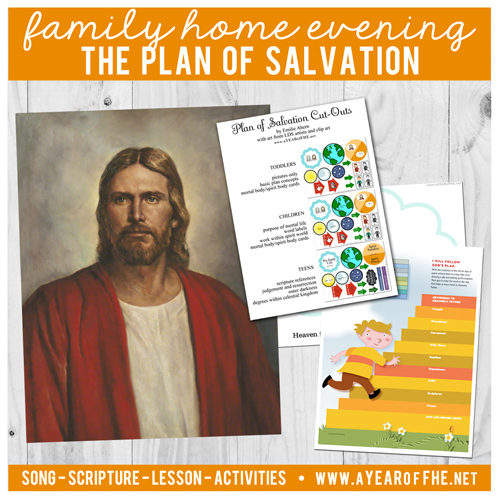 We have Family Home Evening because we want our entire family to be able to live together in the Celestial Kingdom some day. Heavenly Father knows we will make mistakes so He sent Jesus Christ to help us repent when we make wrong decisions. If we do our best, we can live with Heavenly Father again someday. Bear your testimony about the plan of salvation and your desire to live with heavenly Father someday with your entire family.Bear testimony that Jesus Christ made it possible by being our Savior. Activity: Choose from the following activities as they best suit your family. Thanks for putting this together. It looks like a great lesson! This is a great lesson and will work so well for my family tonight! Thank you! Great Lesson! My little girl will be able to teach this one. Thanks! You don't know what an answered prayer your blog is to me tonight. I have been struggling to find a way to have fun, meaningful FHE, homeschool my four children and get 'daily life' done as well. I've been praying especially for an answer, and your blog truly is it. Thank you so, so much for all of the time, energy and effort you put into this blog, these amazing FHE lessons and printables and your family! It shows here! My family really enjoyed this lesson! I like how you adapted the pictures for different aged children. Thanks! I loved these lessons an would also share them in the nursery. Thank you so much for all the time and effort you put into your blog. You have helped our family to be re-energized in holding family home evenings again. I have shared your link with many friends, and we shared your blog address in our most recent RS newsletter. Thank you again!! This is awesome! Thank you so much! My family struggles to come up with FHE ideas for our young kids, but this is perfect! THANK YOU, THANK YOU!!! Thank you SO so much for this website. I know that we need to do FHE each week, and we try very hard to make it happen, but your website really helps it to come together in an organized manner. I especially appreciated that you had 3 different versions of the cutouts to adapt to different family models. Thanks again, I will be a regular reader and sending others your way! LOVED that you offered this in 3 versions for 3 age groups, i didnt print it on card stock and instead placed tape on the back and stuck them on a cookie sheet and this way I could hold up the sheet and they could see. My boys are 3,5,7 and this really helped them see the plan visually so when we talk about returning to live with Him someday, or in the preexistance they have a better idea of what we mean. THanks for all you're hard work I LOVE it, and its seriously an answer to my prayers as a busy mom. Thank you so much for taking the time to do this for others.. I am printing these out for the YW in our ward for their PP.. they are laminating then going home and giving a FHE on this. Thanks for making it so easy for me to serve!! Awesome! I loved using the diagram with my kids. It really helped my 3-year old focus on what we were teaching and see that our body and spirit were two different things joined together. I am always amazed at your lessons. They are simply wonderful....Thank you for taking the time and sharing your talents! Thanks for the wonderful printable. This blog is amazing and so helpful! Thanks so much, this is an awesome lesson. 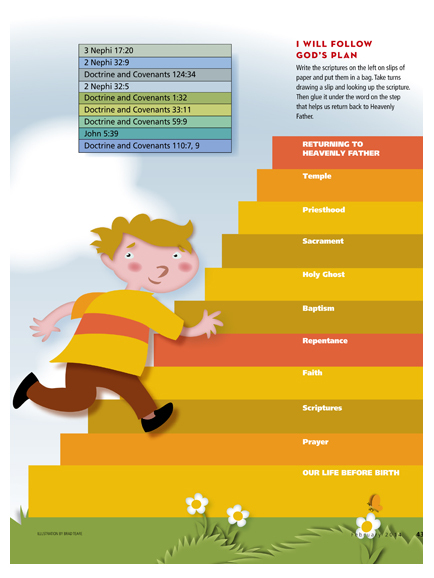 We used it as one of the prep lessons for our Sons upcoming baptism so we talked a little more about the covenents that we need to make while on earth to return to Heavenly Father. This was a great help! Thank you so much Emilie. tomorrow night for young women we are doing a personal progress carnival. I am in charge of Faith and we are going to be working on the plan of salvation for the YW to teach to family for FHE. Thank you for writing all of this out as now I don't have to. I so appreciate all the time you put into these. Your family must be amazing and know the gospel so well. Thanks again. Thank you so much for your hard work. I found your blog via interest and am so excited. I have put off doing family home evening for long enough and your blog has given me some great ideas!. Oh I am so glad I gust stumbled onto your site from Pinterest! Awesome!! Thank you! Thank you so much for this! I really love the 3 levels for the graphics. I can use it at home for my 4 year old twins and I can Use the Teen one to help the YW with Personal Progress Faith Value Experience #6. Thank you, Thank you, Thank you! I am using it to help the YW with the Personal Progress Faith experience #6 as well. This is perfect! Love your site! thank you for this great lesson! I love that this lesson can be personalized for toddlers, because that's all we have! Also, this lesson will be perfect tonight, since we just received some unfortunate news. Thank you again. love your color pieces to teach the plan of salvation. Thanks for making this available! I love your blog! This is wonderful! Now I just need to get my color printer working again! Thanks for putting in the work. You are a blessing. Thank you for this Plan of Salvation FHE. It's going to help so much as we teach our 3 year old. I appreciate it! you rock. thanks for all the hard work. worked for my kids as well as teaching in young women. Thank you Thank you!!!!! I am so grateful for people like you that help make my life easier! I LOVE the different diagrams for different ages! We will use one for our family and the older ones for the Young Women to teach their families! Thank you! What a great lesson, Thank you for putting it together! Wow. What an amazing resource your blog is. Our oldest is 4 and just recently I've decided we need to be doing more meaningful FHEs (aka: not just reading a scripture story and acting it out..) I started to compile a list of topics and scripture stories and once I found your blog, I realized all I really need to do is bookmark your site. Thank you so much for providing the free printables as well. I am so not tech savvy and it's wonderful to have those all ready to go. Thank you so much for sharing your talent! I love your blog - I have used it many times. We had a death in our family last week, so for my little ones we are doing the plan of salvation fhe. Thank you for posting your printouts and lessons. Thanks for sharing....I'm planning to use for FHE and Activity Day Girls' lesson! Thanks so much your so helpful now I can add it to my moms collection. THANK YOU! We are having an investigator family over for FHE tonight and the Elders want us to teach them the Plan of Salvation. This post is a lifesaver. Thank you so much! This is just what I have been looking for!! Thank you! 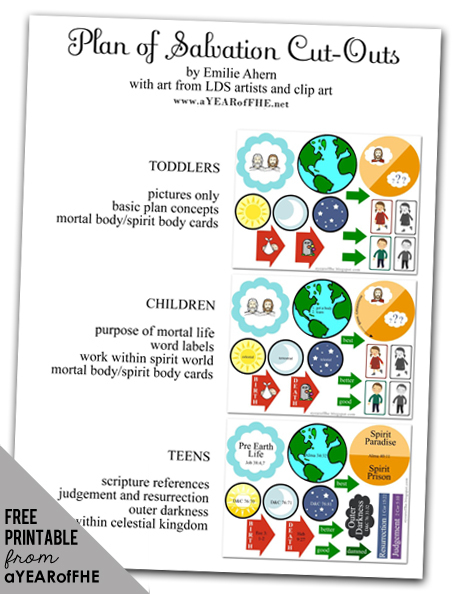 As Ward Missionaries, The Plan of Salvation cutouts will be great to use with not only children but with investigators and new and returning members as well. Thank you! I just did this lesson (in conjunction with the Old Testament reading challenge from the January 2014 Friend magazine) with my five and three-year old and it went wonderfully. Thank you. THANK you so much!! You are offering such a great service!! Thank you for all the time you took to put this together! It is so helpful! Thank you! This is a perfect lesson with children of all ages under one roof! Thank you! Thank you so much for putting all this together and making it so accessible and easy! I love your site and am so grateful for all the work you put into it that makes it so much easier for me to plan a fun FHE with my little family. Thank you so much for sharing your talent. I love that everything is all together in one place. It made it easy for prep and delivery of such a complex message. Great work! I used this for a last minute visual for February's Come Follow Me Theme, I was happy to find one that was easy and all together on one page for teens. Thank you for sharing your work! So excited to use this wonderful lesson plan! We are making FHE Binders for our Mia Maids for Mutual tonight and will include this lesson plan for them to use in their future families! Thanks! This is great! The visuals will be perfect for my 3 year old. Thankyou for the help. I panic around Family Home Evening lessons. Which lessons do you think would be best if I have children from all those age groups? Thanks you for sharing your lessons. I am always at a loss on how to do FHE. Your lessons are fabulous! I love studying the plan of salvation. Thanks so much for putting this together. I'm using it in primary this week. Obrigada por compartilhar tão inspirada ajuda para essa aula. O Plano de Salvação foi o que me motivou a ser um membro da Igreja, é um assunto muito especial.